An old recipe, but a good one that I just recently updated with some new photos and also a quicker way to cook these meatballs in an Instant Pot too! This has been a favorite of mine for a long time now. Ridiculously easy? Yep. This recipe that's a healthy take on an old classic. 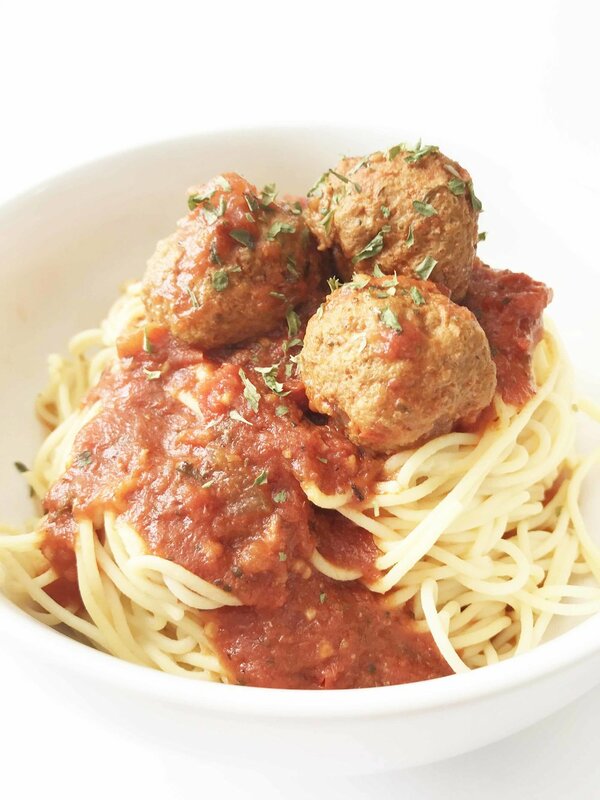 Flavorful turkey meatballs simmering in thick hearty tomato sauce all day long to cook. Who needs the pre-made bottles off the shelf? Not this girl. Everything's bigger in Texas, right? I kept the size of these meatballs rather large since I have some fun plans for the leftovers. And the sauce? Oh, yes. The. Sauce. This is amazing stuff right here. I used whole peeled tomatoes in my version because I just love biting into the chunky pieces of tomato. I'm a tomato lover, can you tell? You can eat this over spaghetti noodles as I did (I used some chickpea based noodles here, but zucchini noodles, whole wheat, etc are fine too!) or this also great over spaghetti squash! Meatballs subs? Sliders? A delicious spaghetti sauce with healthified Italian turkey meatballs that are cooked righ tin the sauce. Perfect to make in a crock pot or instant pot for a quick weeknight meal! In a large bowl, mix together all of the meatball ingredients until well combined and set aside. In a the base of the instant pot (or in a skillet if using a crock pot), heat 1 Tsp. olive oil over medium heat and sauté the 1/4 C. onion and 2-3 garlic for the sauce. Once the onions are tender and translucent, turn the sauté feature off. Pour the remaining ingredients for the sauce into the base of the Instant Pot (or slow cooker), along with the onion and garic mixture. Give it all a good stir! Use a scoop to evenly spoon out meatballs. (Use a 1 Tbsp. for small meatballs and 2 Tbsp. for larger meatballs.) Form into rounded meatballs and carefully place into the pot with the sauce. Make sure the meatballs are nearly covered with the sauce and secure the lid. For the Instant Pot: Set the steam valve to 'sealed' and cook on manual for 35 Minutes. Quick release or natural release the pressure once done. For the Crock Pot: Cook on low for 6-8 hours or high for 4-6 hours. Serve right away as desired over noodles, veggie spirals, etc. and enjoy!